Maria Ressa, with over three hundred thousand followers on Twitter, is actually infested with fake followers. 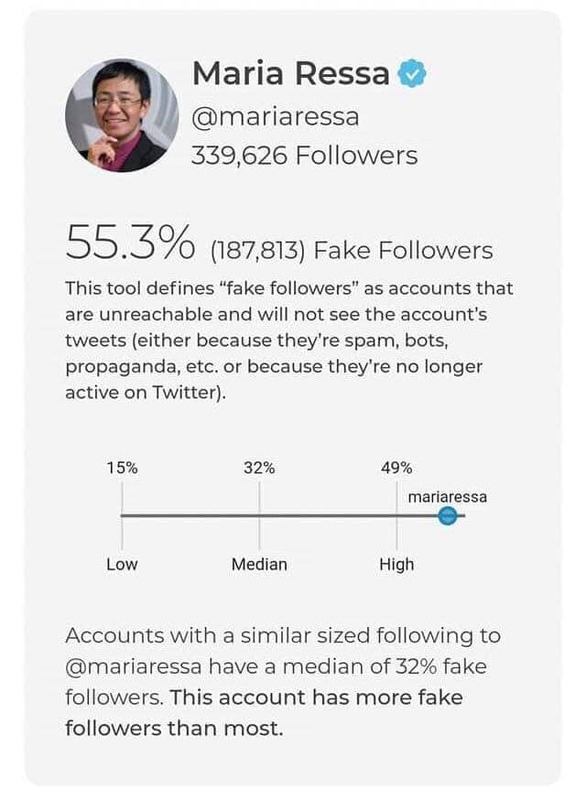 Pegged at 55.3% or 187,813, Maria Ressa is actually one of the few Filipinos who have fake followers. This, according to a tool popularly used even by media entities like Rappler. A screenshot of the tool's result for Maria Ressa's Twitter account. "This tool defines "fake followers" as accounts that are unreachable and will not see the accounts tweets (either because they're spam, bots, propaganda, etc. or because they're no longer active on Twitter). Account with a similar sized following to @mariaressa have a median of 32% fake followers. This account has more fake followers than most," the tool revealed. Who is the propagandist now, Maria?